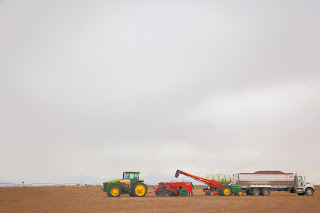 A few weeks back I was able to photograph the planting at Jim and Sue McCullough’s mega potato operation in southern Colorado’s San Luis Valley. City mouse that I am I had no idea that when you plant potatoes you literally plant potatoes. 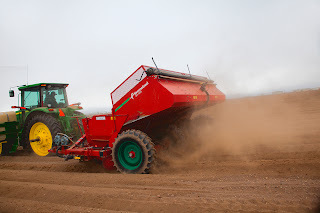 Sue, a regular painting partner of Peggy’s, had been dangling the chance to photograph the McCullough spread for it seems like a year and I have finally begun my introduction to the complex and oh so equipment intensive business of producing 1,400,000 hundred weight of potatoes. So this is a major deal. It is not a timid undertaking or one to be attempted without a full measure of cojones. And speaking of cojones, Jim says, “You have to have potatoes available when buyers are buying even if some years you lose a little on every sale.” You're a player or you're not. So, the intrepid McCulloughs bank, that's the operative word, on a high yields and high prices most years. That means reinvesting, re-thinking and re-engineering the business constantly. Jim aspires to produce and sell 2,000,000 hundred weight of Russets and has a plan in place, which is to say in his head, to do just that. 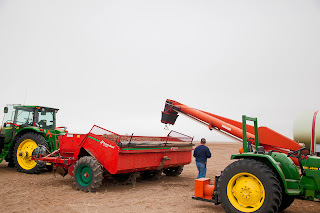 This story that will require shooting the sprouting vines around the Fourth of July and the harvest in early fall. Then there’s the warehousing, packing and distribution extravaganza that is a low light nightmare. Get ready for a rush of motion blur. This story has a lot going for it. It’s new turf. It’s learning about the dusk to dawn farming lifestyle. And it’s in my beloved San Luis Valley with the McCulloughs as my hosts. Big thanks to them. Thanks Madison. It's a pleasure to get your feedback. I hope all is well in your life as in mine. I don't do color all that much but this one felt like a color story. This one makes no pretense of being "art" but hopes to capture the feeling of the place, the dirt and vast flatness. Madison is right. The top photograph is a child's dream and eye view - all that big, beautiful, brightly-colored equipment - in elevation, ready to be driven. The bottom image with the tanker in the foreground is quite wonderful as well. A great grouping! Great post Steve! 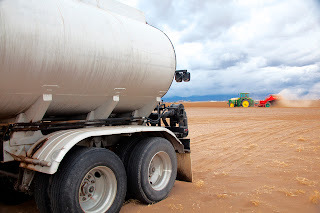 We liked the pictures- the image with the tanker in the foreground happens to be our favorite. Can't wait to see you soon as the potatoes are starting to grow pretty well right about now.